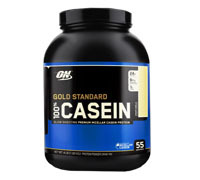 Casein proteins are pH sensitive and gel in the acidic environment of the stomach. As a result, it can take more than twice as long for caseins to be broken-down into their amino acid subcomponents than whey and other proteins. Casein is the most abundant protein present in milk. It is considered a high quality protein because it is easily assimilated and it supplies sufficient quantities of amino acids that cannot be synthesized by the body. Another benefit is increased satiety (feeling of fullness or satisfaction). Casein exerts a slight pressure on the stomach walls. In effect, this pressure signals to the brain to stop eating because the stomach is full. Casein is the most slowly digested and absorbed type of protein. This helps create a "timed-release" effect, providing a steady stream of amino acids to your muscles over a long period of time. The net result is a greatly enhanced anti-catabolic environment which is much more friendly to growth and recovery.